The Defensive Line and Linebackers group is one of the most talented groups that the Combine has seen in a while, especially the DL. The defensive tackle position is probably the deepest group in the entire Draft and I would bet that at least 8 defensive tackles go in the first 40 picks. It’s an unprecedented year for them and it’s a good year to need a DT. Andrew Billings, DT, Baylor: Billings had himself a pretty solid day at the Combine. Putting up at 1.77 10-yard split (5.05 40) at 311 lbs is nothing to turn your nose up at. He then added 31 reps on the bench, a 27.5″ vertical and a 9’5″ broad jump. He was never going to set the world on fire as an athlete but he was steady during the day. He looked pretty smooth during the drills for a guy his size too. Joey Bosa, EDGE, Ohio State: Bosa ran slower than he (and everyone else) expected at the Combine but he still managed a 1.69 10-yard split (4.86 40). He posted 24 reps on the bench, a 32″ vertical and a 10′ broad jump. 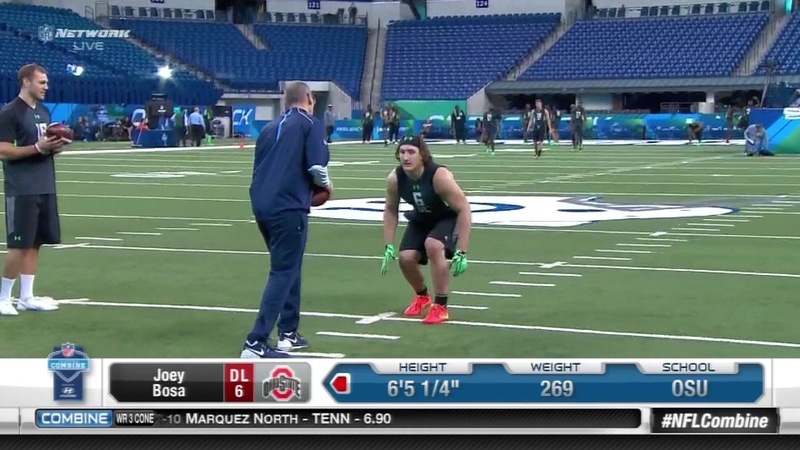 Bosa is an explosive guy and he was one of the smoothest athletes in drills. He did not even have trouble dropping back into coverage during linebacker drills, though I’m not sure why you would want him to drop into coverage. He could be a 3-4 OLB, but he’s better suited as a 4-3 DE. DeForest Buckner, DT, Oregon: One of the largest people at the Combine this year and that is not an exaggeration. He weighed in at 6’7″ 291 lbs with 11 3/4″ hands…that’s the size of a piece of paper length-wise. He has straight up tennis rackets for hands. On top of that, he proved to actually be a pretty good athlete. Buckner posted a 5.05 40 (1.77 10-yard split) with a 32″ vertical and a 9’8″ broad jump. I would be floored if Buckner did not go in the Top 10 and he checked off all of the boxes in Indianapolis. Shilique Calhoun, EDGE, Michigan State: Calhoun had an absolutely phenomenal day at the Combine. 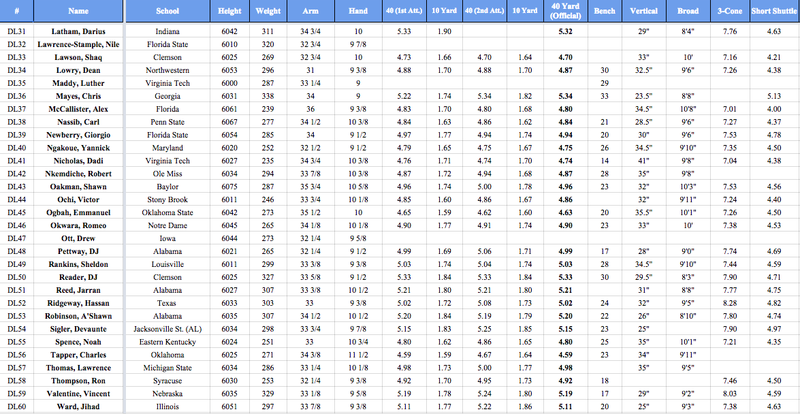 At 6’4″ 251 lbs he ran a 4.82 40 (1.77 10-yard), added 23 reps on the bench, a 35″ vertical and 9’7″ broad jump. Then he showed he’s a much better athlete than he gets credit for during the drills. He looked pretty natural dropping back in coverage and solidified himself as an option for 3-4 teams, which is going to be huge. It’s always a huge asset to show off your versatility and opens you up to more teams to be drafted by. Kenny Clark, DT, UCLA: Clark quietly had one of the best days at the Combine during Day 3. I say quietly because he was overshadowed by the bigger names but tested well for a DT. At 6’2″ 314 lbs he had a 10-yard split of 1.72 (5.06 40), then posted 29 reps on the bench, a 28.5″ vertical and an 8’6″ broad jump. Where he really excelled though was during the drills showing off his quickness and movement skills. Willie Henry, DT, Michigan: I’m probably a bit biased here but I think Henry is a very good prospect. He’s just starting to scratch the surface with his potential and I think that if he gets on the right team with the right coaches that he can soar. He weighed in at 6’2″ 303 lbs and ran a 5.00 40 with a 1.75 10-yard split, 28 reps on the bench, a 30.5″ vertical and a 9’2″ broad jump. He showed great change of direction during drills for a guy his size and showed good punch on the bags. It looks like working with Harbaugh and Co. for a year has done wonders for his technique. Matt Judon, EDGE, Grand Valley St: A very sneaky good prospect but I’m starting to think that the cat may be out of the bag with Judon. Judon weighed in at 6’3″ 275 lbs and ran a 4.73 40 with a 1.68 10-yard split. Then he posted 30 reps on the bench, a 35″ vertical and a 9’1″ broad jump. He’s got some explosiveness to his game, which is a necessity as an edge rusher that comes from a smaller school. On top of that, he looked natural dropping back and was very fluid in his movements during drills. Shaq Lawson, EDGE, Clemson: The second best defensive end/edge rusher in the draft behind Joey Bosa. He’s an extremely solid athlete, running a 4.70 40 (1.64 10-yard) at 6’2″ 269 lbs and posting a 33″ vertical and a 10′ broad jump. Perhaps his best effort came in the three cone drill, where he posted a time of 7.16, which is pretty damn fast for a DE (the fastest 3 cone time for a RB was 6.83 and the RB was 5’10” 208 lbs). As you can see in the video below, Lawson is a very polished player and moving around is zero problem for him. He showed he can drop back in coverage, which is a great asset for him because it erases any thoughts of him being a tweener. Robert Nkemdiche, DT, Ole Miss: Nkemdiche showed up to Indy and did everything people thought he would/could. He’s a freak athlete and his issues are solely off-the-field. At 6’3″ 294 lbs he ran a 4.87 40 (1.68 10-yard), posted 28 reps on the bench, a 35″ vertical and a 9’8″ broad jump. Unfortunately for him, I’m thinking Nkemdiche drops like a rock because he’s a total wildcard. He was once thought of as a potential top 3 pick and now I expect him to go later than 20. All the talent in the world cannot save an inconsistent motor with off-the-field issues. Shawn Oakman, DE, Baylor: Oakman is a guy that is huge and jacked and that’s really about it. He shows flashes on tape but is not a consistent player whatsoever. He looks to be a decent athlete at times and then in other instances he’s really stiff. He weighed in at 6’7″ 287 lbs and ran a 4.96 40 with a 1.78 10-yard split, put up 23 reps on the bench, a 32″ vertical and a 10’3″ broad jump. He’s got some athletic tendencies, but I really thought he was going to be faster than that. At the end of the day, his inconsistent motor is going to be too much for him to overcome with some teams. A decent day, but nothing that will turn some doubters around. Emmanuel Ogbah, EDGE, Oklahoma State: Like Nkemdiche and Oakman, Ogbah has some really hot and cold tape. But, Ogbah is more of an athlete, like Nkemdiche, and so someone is bound to take a chance on him early on. At 6’4″ 273 lbs he put up a 4.63 40 with a 1.59 10-yard, added 20 reps on the bench, a 35.5″ vertical and a 10’1″ broad jump. He looked great going through the drills and seemed to be a pretty polished player, moving laterally well and dropping into coverage with ease. If he can erase questions about his motor, he can go in the first half of the first round. Sheldon Rankins, DT, Louisville: Rankins is absolutely flying up team’s draft boards right now. I thought at one point he would be a sneaky pick for the Lions but now I’m not even sure he will last until 16. He tore up the Senior Bowl and then did a fantastic job at the Combine. It turned out he’s a pretty decent athlete for his size…posting a 5.03 40 (1.74 10-yard) 28 reps on the bench, a 34.5″ vertical and a 9’10” broad jump. He looked smooth and powerful during drills and he continues to do wonders for his stock. #Bama DL A'Shawn Robinson asked if he shaves his head & grows beard for intimidation: "It wasn't an intimidation thing. I was going bald." Just an absolutely legendary quote. I’m a big fan of A’Shawn and would be quite alright with the Lions taking him at #16, but he did not have a great day. He’s not an athlete, posting a 5.20 40 (1.79 10-yard), 22 reps on the bench, 26″ vertical and an 8’10” broad jump at 6’3″ 307 lbs. And then he did not do anything special in drills. It’s going to come down to the tape for A’Shawn on whether he goes early in the first or not because he tested poorly. Noah Spence, EDGE, Eastern Kentucky: Spence is a guy that has always been thought of as a first round talent, it was just the off-the-field drug issues that were raising questions. He’s passed a ton of drug tests over the past couple years, and crushed the Senior Bowl…but then he ran a 4.8 40 (1.62 10-yard) at the Combine. Now I’m not going to say that you cannot draft him in the first round, but his stock took a hit here. He put up 25 reps on the bench, a 35″ vertical and a 10’1″ broad jump, so he does have some explosiveness, but the overall speed seems to be lacking from his game. Basically what he did at the Combine does not match what he showed on tape and so that raises a red flag. He was thought to be a Top 10 pick after the Senior Bowl, but he did not flash anything during drills that made me think “gotta have this kid”. Spence pro day: Scouts from 24 teams, multiple scouts from some teams. Ran high 4.6-mid 4.7s in 37* weather, wet field from misting & rain. Charles Tapper, EDGE, Oklahoma: Tapper improved his stock more than anyone on Day 3 and perhaps anyone at the entire Combine. Tapper weighed in at 6’2.5″ 271 lbs and then ran a 4.59 40 (!!!) with a 1.59 10-yard split. That is freaking moving. He only posted a 34″ vertical and a 9’11” broad jump with 23 reps on the bench but that speed was something. And if you’re thinking that he’s just a straight line speed guy, he showed in drills that he is not. He looked very fluid in his movements and even dropped back with relative ease in coverage drills. He’s definitely going to have some teams going back to his tape to reevaluate him, and not in a bad way. 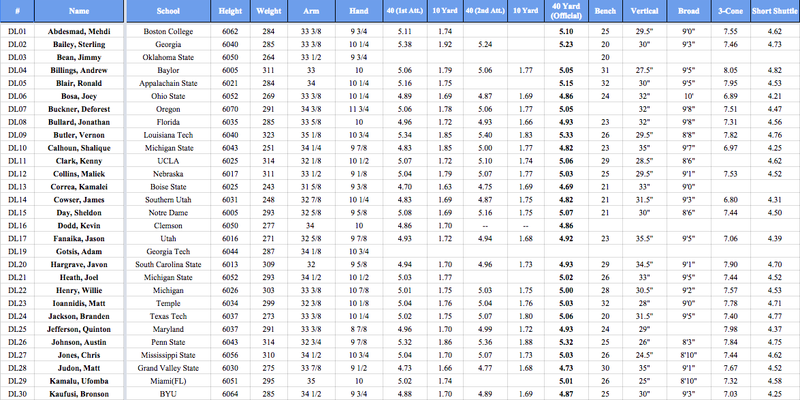 Seriously, this group is absurd, you should have seen the size of this list before I cut it down. And now we move on to the linebackers. Su’a Cravens, LB, USC: Cravens is a pure football player and will probably end up going in the first round…but he had one of the worst Combines testing-wise out of anyone. Cravens is supposed to be a LB/S tweener and he proved to be a poor athlete. He weighed in at 6′ 226 lbs, did not do any of the running and then posted a 27″ vertical and a 9’6″ broad jump, which almost certainly limits him to linebacker. That being said, he looked very good at linebacker during the drills and seemed to be very natural. It’s going to be interesting to see how teams use him, but I’m guessing he’ll be used exclusively at middle linebacker unless he runs well at his Pro Day. Kyler Fackrell, LB, Utah State: Fackrell is a guy that is going to continue to gain momentum as we get closer to the Draft. He’s got prototype size (6’5″ 245 lbs) and is a solid athlete. He posted a 4.72 40 (1.62 10-yard split), a 34.5″ vertical and a 10’1″ broad jump. So he’s got prototype size and he’s explosive…keep an eye on this one. Travis Feeney, LB, Washington: Travis Feeney opened everyone’s eyes with his extremely athletic day at the Combine. He weighed in at 6’3.5″ 230 lbs and then ran a 4.50 40 (1.59 10-yard) and then posted a 40″ vertical and a 10’10” broad jump. As a linebacker, that’s going to turn some heads. Especially when you blend in during drills and do not look out-of-place from a technical point of view. Leonard Floyd, EDGE, Georgia: Floyd had one of the biggest power moves of the day, running a 4.6 40 (1.60 10-yard split) at 6’5″ 244 lbs and then opting not to run a second time, thinking he was good with that time (which he is). He then posted a 39.5″ vertical and a 10’7″ broad jump. He helped himself as much as anyone in terms of proving his athleticism, but I’m still not sure he could drop into coverage. He seemed very stiff and unsure of himself at times. I think Floyd would excel in a 3-4 OLB spot, but exclusively as a pass rusher. Myles Jack, LB, UCLA: Jack is still working his way back from a knee injury and so he did not participate at the Combine, but he had to be put on here because he’s still probably going to be the first linebacker taken in this Draft. For my money, Jack, Laremy Tunsil and Jalen Ramsey are the three best overall players in this Draft. Darron Lee, LB, Ohio State: Arguably the biggest winner of the entire NFL Combine. Lee weighed in at 6′ 232 lbs and is a LB/S tweener type but has the athleticism to back up the tape. He posted a 4.43 40 (1.55 10-yard), 17 reps on the bench, 35.5″ vertical and a 11’1″ broad jump. He’s an extremely explosive player and is going to make plays on defense for someone next fall. His lateral movement and change of direction skills looked to be elite during the drills and his versatility is going to make him a major asset. He was thought to be a fringe first rounder but I would say that he is a lock to go in the first round and could go as high as #16. Reggie Ragland, LB, Alabama: I thought Ragland was going to be a bit faster than he was, but he still checked off the right boxes. At 6’1″ 247 lbs he ran a 4.72 40 (1.66 10-yard), a 31.5″ vertical and a 9’8″ broad jump. He looked stiff when dropping into coverage and trying to shuffle, but he was good in the tight area drills. At the end of the day, Ragland is a football player with a nose for the ball carrier and you cannot teach his type of football sense. Jaylon Smith, LB, Notre Dame: Poor Jaylon Smith. Smith was a lock to go in the Top 15 until he suffered a brutal knee injury and now there are rumors that he has nerve damage similar to what Marcus Lattimore suffered. Teams will perform their own medicals on him, but if this ends up being true, Smith will drop like a rock. It’s really too bad that he may not get a shot after everything he went through. Scooby Wright, LB, Arizona: Remember when I said Cravens had one of the worst testing days? Scooby had the worst. Wright was always highly thought of in college, even being discussed as a preseason Heisman candidate, but then he spent most of last year dealing with injuries and his stock has taken a major hit. He weighed in at 5’11” 236 lbs, then ran a 4.90 40 (1.67 10-yard), 22 reps on the bench, a 31″ vertical and a 9’5″ broad jump. He has some explosiveness, but clearly does not have top end speed (or isn’t fully healthy) and then he did not do anything to stand out in drills. He was thought to be a lock for the first round at one point, but between his health and speed issues, I would say there is a 0% chance he goes round 1 now. This entry was posted in NFL and tagged 2016 NFL Scouting Combine Recap Day 3, 2016 NFL Scouting Combine Recap Day 3: Defensive Linemen and Linebackers, A'Shawn Robison, Adolphus Washington, Alabama, Andrew Billings, Arizona, Baylor, Carl Nassib, Charles Tapper, Clemson, Darron Lee, DeForest Buckner, Eastern Kentucky, Emmanuel Ogbah, Georgia, Grand Valley St, Jarran Reed, Jaylon Smith, Joey Bosa, Kenny Clark, Kevin Dodd, Kyler Fackrell, Leonard Floyd, Louisville, Matt Judon, Michigan, Michigan State, Myles Jack, Noah Spence, Notre Dame, Ohio State, Oklahoma, Oklahoma State, Oregon, Penn State, Reggie Ragland, Scooby Wright, Shaq Lawson, Shawn Oakman, Sheldon Day, Sheldon Rankins, Shilique Calhoun, Su'a Cravens, Travis Feeney, UCLA, USC, Utah State, Washington, Willie Henry. Bookmark the permalink.